What is growth mindset? 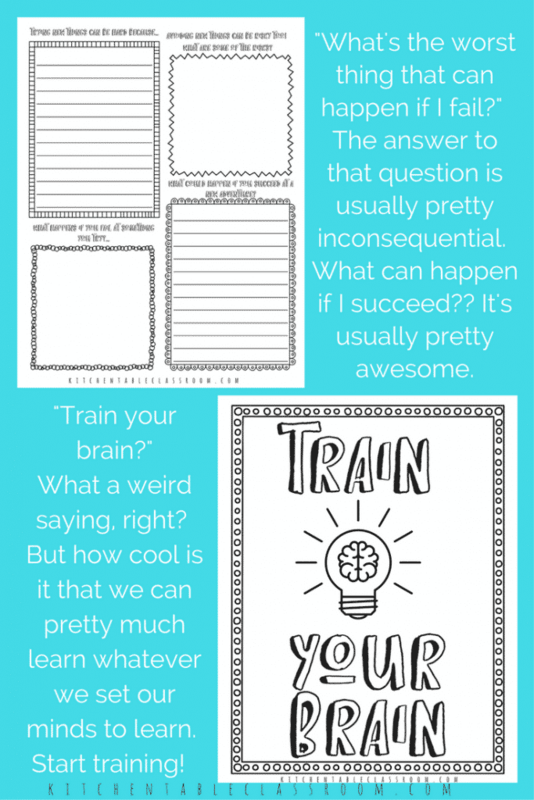 Growth mindset has kind of become the mantra of our little homeschool and my grown up decision of starting a blog. Growth mindset celebrates the process, the effort of learning new things, rather than the outcome. Do we want a positive outcome? Yes, ma’am. But sometimes trying weird, new things, requires taking a risk, maybe even failing. A growth mindset is not just having an open mind or a positive outlook. It’s more specific than that. A growth mindset embraces the idea that a person’s basic traits can be nurtured and developed through practice and hard work. Natural born talent and intelligence are just a tiny piece of the success puzzle. The focus becomes on learning and progressing rather than immediate success and “looking smart.” How encouraging is the idea that effort and practice, trial and failure can make you stronger, smarter, and more successful at your goals? What is a fixed mindset…. In order to fully appreciate what a growth mindset is we need to define the opposite, or the fixed mindset. A fixed mindset implies that a person is born with fixed amount of intelligence and natural talent. What you get is what you get. A person with a fixed mindset believes that natural born talent and intelligence is what creates success, without the effort or drive. Written down this sounds like kind of a crazy way to think, right? Who believes you’re either smart or you’re not? But it’s more complex than that. It’s not just about being smart or dumb. These same principles can apply to any aspect of life; athletic skills, musical ability, artistic endeavors, or even being good at social endeavors like meeting new people. If you’d like to learn more about the science behind the growth mindset check out this book that started it all. We never set out to get it wrong, right? But if we only tackle projects, assignments, or jobs in which we are guaranteed to succeed we’re not really stretching ourselves at all. Even those who believe in a growth mindset wouldn’t encourage effort with reward. Everyone has goals and they want to succeed. But the piece of the growth mindset that really resonates with me is the fact that the stigma of failure is gone. Sometimes getting wrong and screwing up is part of the process of getting it right. As a grown up there are lots of things I can’t do….yet. About a year ago I started this blog. I am not a tech savvy person to say the least. I have the computer skills of a toddler. Over the last year I have literally learned one million things, most of which were things I didn’t even know I didn’t know. I have done many things super wrong and very much the hard way, and then done them over again when I know better. It hasn’t been a straight line but I did it! I love for my kids to get the chance to see people of all ages putting themselves out there and trying new things. Grown ups most certainly do not have the market on having it all figured out. Here’s the thing I notice about applying this theory to kids. Whether you’re a parent or a teacher it takes work to give your kids these experiences. Providing opportunities for them try all these awesome new things, adjust what they know, and try again doesn’t happen without some effort. It doesn’t happen without effort but it’s worth it! Is there something you would love to know about but is totally out of your wheel house? Jump in and take one step towards learning about it. Little steps totally count! Really, what will happen if you fail? In most cases not too much. Arm yourself with new information or a new strategy and tackle the idea again. That’s progress! Turn the tables and ask “What happens if I try idea XYZ and it’s something I can do and I’m passionate about and it adds value to my life?” The answer to this one is usually bigger and more exciting- endless possibilities live here! That’s progress! Growth mindset is more than just a saying or a pretty quote. It’s really how I want to raise my kids. I’ve written more about in other posts. 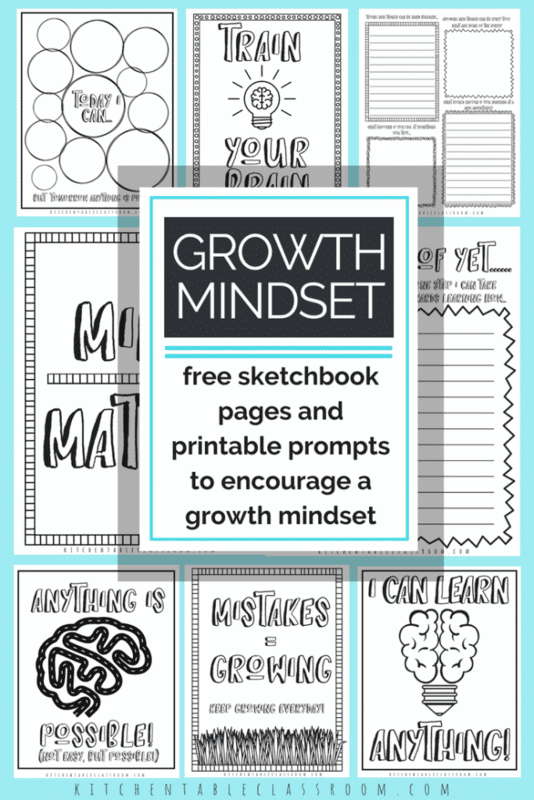 This printable book for kids, this poster and lunchbox notes, this list of books that demonstrate growth mindset, are all free resources to get you started on the growth mindset train. 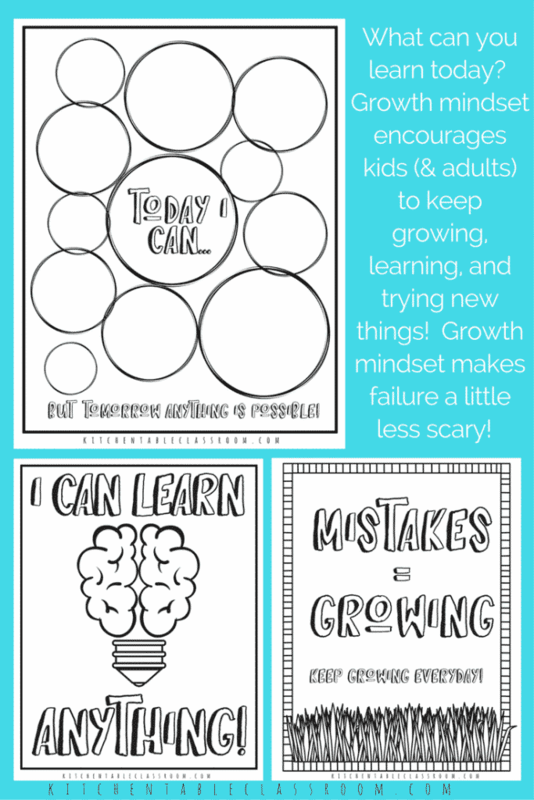 Also check out these pretty printable growth mindset quotes that are my most visited post ev-ah! Want to help your kids find out “what is growth mindset?” Grab this printable pack of growth mindset activities? All you need to do to get these growth mindset printable activities is use the form below to become a subscriber. Upon confirming your subscription you’ll get a password that unlocks my Free Resource Library. 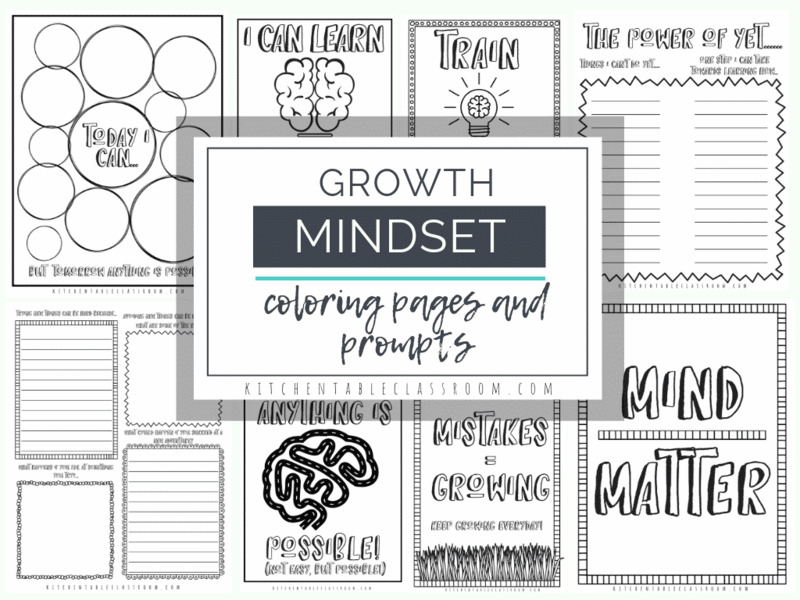 This printable pack to help you explore “What is growth mindset?” along with dozens and dozens of other printables are all housed there in easy to print PDF form. If you’re already a Kitchen Table subscriber there’s no need to subscribe again. Just use your subscriber only password to access my Free Resource LIbrary and download away. If you forget your password I always include it at the bottom of every newsletter- just in case! If you enjoyed exploring “What is growth mindset” with these free printable growth mindset activities then please share them on your favorite social media channel. Why can’t I print the “today I can” page by itself? The PDF file contains all of the pages. You should be able to print individual pages through your printer menu. Good luck! 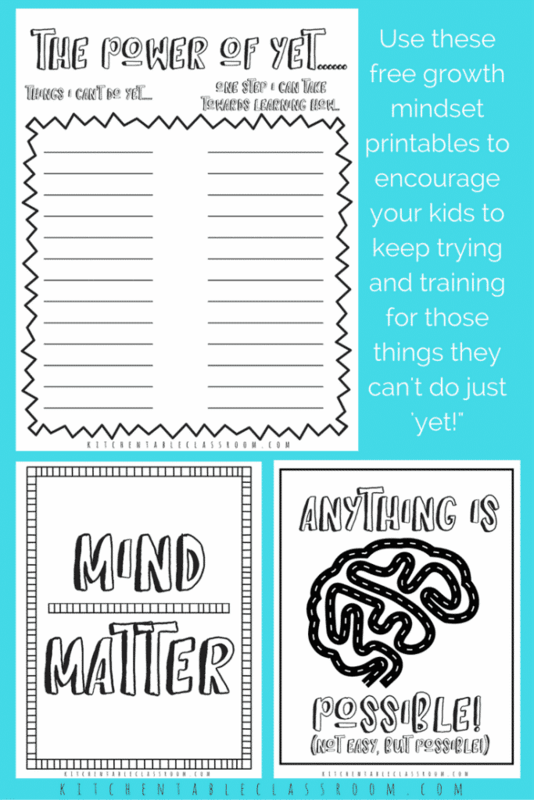 How can I print the Mindset printables? WHen you subscribe, and then confirm, you should get an email with a subscriber only password. Just head to my Resource Library and enter that password. The printable resources for every post are housed there in easy to print PDF form! If you have any trouble at all feel free to email me at kitchentableclassroom@gmail.com anytime! Thanks Kristeen! I’m glad you’ve found something for you! You website is absolutely amazing! Just what I have been searching for. I have subscribed and been to the free resource page however I am still unable to find the Growth Mindset printable….any help appreciated. Thank you sooooooo much for these printables! I love them and hope to share them with certain individuals who need a little encouragement. These are great!